Hanoi (VNA) – The presence of 21 Vietnamese pagodas in Thailand has demonstrated the two nations’ cultural interaction, thus helping promote the bilateral comprehensive strategic partnership. 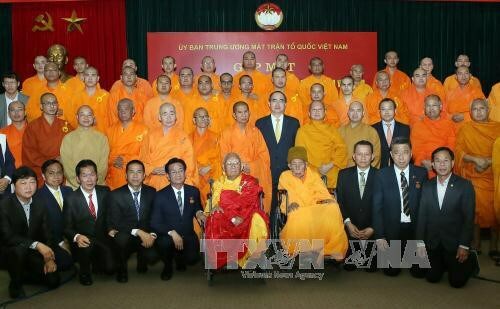 Most Venerable Thich Kinh Chieu, head monk at Pho Phuoc pagoda, who led a visiting delegation of 50 Annam Kiya Buddhists and overseas Vietnamese in Thailand, made the remark at a meeting with President of the Vietnam Fatherland Front (VFF) Central Committee Nguyen Thien Nhan in Hanoi on March 27. The monk said the 21 Vietnamese pagodas were built in eight cities and provinces across Thailand, receiving due attention from Thai kings. Apart from ritual and spiritual activities, the pagodas also open classes to teach Vietnamese for expatriates, he added. Eight pagodas have been attached with the plates bearing Vietnamese names, which aims to introduce visitors the origin of the pagodas as well as the Vietnamese cultural vitality in Thailand, he noted. The pagodas also help strengthen the solidarity of the Vietnamese community in Thailand, which now numbers 100,000, and educate young generations about the national unique culture, he said. Nhan expressed his pleasure to receive the delegation and recognised the Buddhists’ significant contributions to developing the Vietnamese Buddhism over the past 200 years in Thailand. The head monks at 21 Vietnamese pagodas in Thailand are the symbol of connection between the two countries, he said, hoping that all the pagodas will bear Vietnamese names.